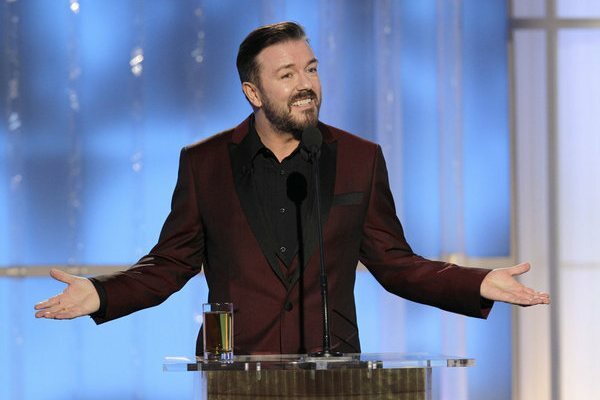 The Golden Globes were pretty boring this year, but don’t blame Ricky Gervais. The presenters seemed stiff and stilted, and some of the awards went to the completely wrong people. Let’s start off with Gervais. I really liked Ricky Gervais’ performance last year. Sure, it wasn’t very nice, but he openly mocked the Globes’ poor choice in nominations and their desperation for audiences by automatically nominating big stars that received critical revile that year, like Johnny Depp and Angelina Jolie. This year, Gervais was much tamer. This doesn’t mean Ricky wasn’t funny. He certainly gave a lot of good jokes, some of my favorites mocked the Globes and NBC’s really poor ratings, and also some great zingers on Kim Kardashian, Justin Bieber, and Madonna (right in front of her). Some of the celebrities were good-natured about it, such as Colin Firth, who played along with Gervais’ jokes. I also liked his fake list on what he couldn’t do at the Globes, which involved making jokes about Mel Gibson. But overall, his performance last year was a taboo. Besides his opening monologue and a few jokes by the performers, it was hardly mentioned. Though I still enjoyed Ricky Gervais this year, I liked his performance last year better. Now for the awards. For the movie section, great wins for The Descendants and The Artist for both best picture (drama for The Descendants and comedy for The Artist) and acting, The Help, and The Adventures of Tintin, which nearly makes up the egregious snubs for Steven Spielberg’s other film War Horse for Best Director and Screenplay. And though I was rooting for Alexander Payne to win Best Director for The Descendants, I can express nothing but happiness to see Martin Scorsese win for Hugo, his love-letter to cinema. The film is so under appreciated, and I think that might have given the film a big boost. I didn’t feel Midnight in Paris should have won Best Screenplay over The Descendants, The Artist, and Moneyball, but what are you going to do? Besides, I like Woody Allen and at least they didn’t give it to The Ides of March. What I wasn’t happy to see was Madonna win for Best Song for the movie no one liked or watched W. E. (I said I’d pick any of the other nominees) or Meryl Streep win for Best Actress for the 100th time for The Iron Lady. She’s a great actress, but really, does she need another award? She also gave the worst awards speech that night too. For the television section, the Globes blundered. Good job for Homeland for winning and Modern Family too, though many of the other nominees in the Best Comedy Series category weren’t worthy to even be there. I don’t understand how Kelsey Grammar won for the mediocre melodrama Boss or how Matt LeBlanc won for Episodes (though to be fair was there anyone worthy in the Best Comedy Actor category). Good job for Clair Danes for Homeland and Peter Dinklage of Game of Thrones. And it was a pretty obvious win for Downton Abby. And I cheered as Sydney Poitier and Helen Mirren handed Morgan Freeman the Cecil B. Demille award. Freeman gave the best speech of the night, and thanked the HFPA. So even a night with many lows could still have some highs. Anyway, the ratings were 1% down from last year for 16.8 million viewers, but I’d like to see Gervais back next year. So long Globes.